Invented by Marcel Kerboull in 1975 to deal with transverse acetabular fractures secondary to failed metal-on-metal total hip arthroplasty, this device continues to be used successfully, primarily in France and Japan, where articles are frequently published describing long-term results that demonstrate the efficacy of the implant when it is combined with allograft. 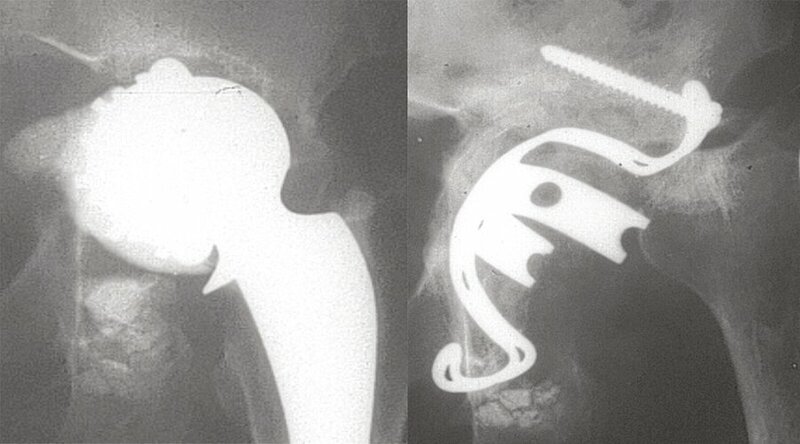 Figure 1 : First Kerboull cross-plate implanted in 1975, shown at two stages of the procedure. Mainly used for revision total hip arthroplasty where loosening of the implant has resulted in bone loss, the device can also be used in primary replacements to reinforce weakened or destroyed bone, as well as when the native anatomy has been affected by a fracture of the acetabulum or acetabular salvage procedures such as a Chiari osteotomy. Even though the surgical technique has been published4 and is often discussed at conferences, we thought it appropriate to describe it anew because the majority of early failures are caused by the surgeon either misunderstanding or failing to follow the technique. This semi-rigid device is used to reinforce the graft during partial or total osseointegration but, thanks to its shape and perfect positioning, it can also be helpful in reconstructing a correctly situated and oriented acetabular cavity (Fig. 2). Figure 2 : Perfectly stable reconstruction at 18 years, with good bone remodelling, indicative of osseointegration of the allograft. However, to achieve this goal it is essential to select the correct size and avoid any distortion, which can in fact weaken the device. 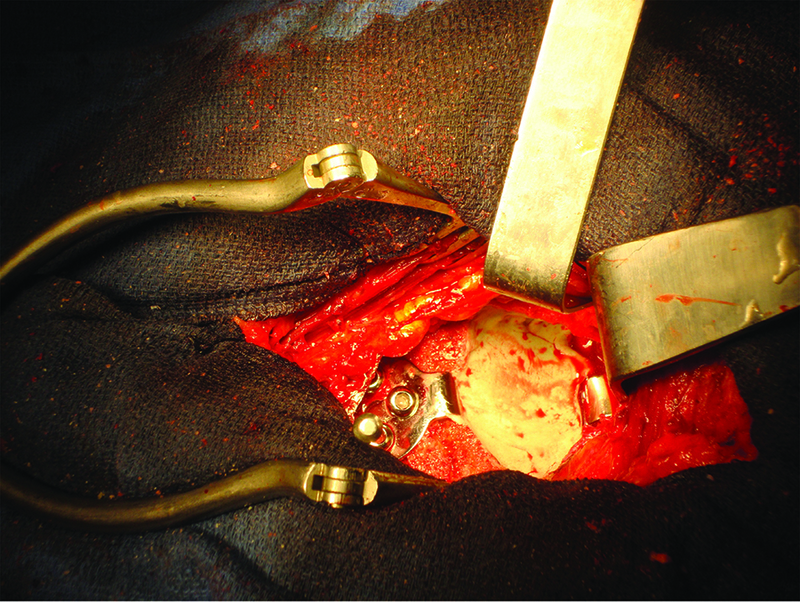 When combined with structural and morselized grafts, this reinforcement device can reconstruct the most severe bone defects, irrespective of their classification.5,6 If there is loss of the inferior margin and pelvic discontinuity, both of which place real limitations on every type of acetabular reconstruction technique, the surgeon will have to use specific solutions, which we will describe below. Several manufacturers offer the Kerboull device in various versions, all of which remain more or less faithful to the original concept. Usually made from stainless steel, it comes in six left and right sizes, with the anterior arm being shorter in order to protect the psoas muscle. The most recent version that we have produced in collaboration with Moussa Hamadouche (Kerboull Cage, Medacta International) is slightly modified. Its overall design and the number of sizes remain the same. However, taking inspiration from Tanaka, we decided to make it from titanium alloy. The purpose of changing the alloy is to increase its resistance to fatigue but without sacrificing rigidity, thanks to a slight thickening of the arms and the plate. In addition, titanium is known for its osseointegration properties, and the convex side of the device has a grit-blast finish to promote fusion with the host bone in places where it is in direct contact. The distal end of the hook, which is placed beneath the margin, has been widened (Fig. 3) for greater stability and better anchorage if this area is thin or partially destroyed. 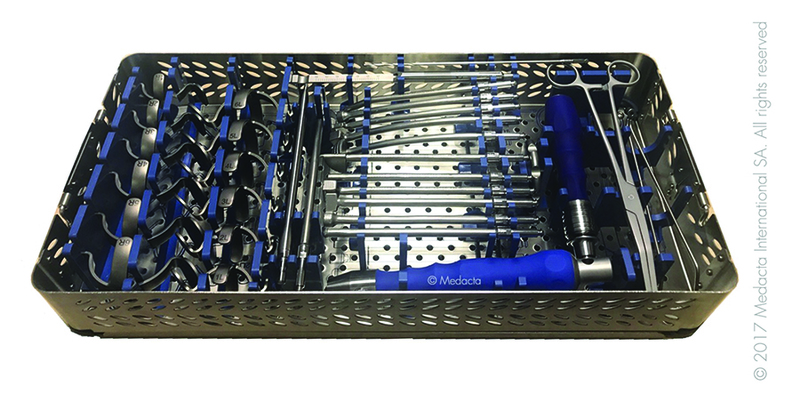 Finally, it comes with a comprehensive set of ancillary instruments including a handle for different sizes of bone impactor as well as screw fixation tools (Fig. 4). I do not intend to discuss the possible approaches, as each surgeon will make this choice based on training and principles. Let me simply say that the ideal approach should expose the full extent of the bone loss and allow perfect access to the inferior margin in order to ensure successful reconstruction. As well as removing the primary implant and any cement, it is essential to excise any intruding fibrous tissue properly as it could hinder osseointegration of the graft. Nevertheless, take care not to worsen the bone defect as you are cleaning the joint, which means avoiding the use of burrs since they can end up removing as much bone as fibrous tissue. It is better, albeit slower, to use curettes in a range of sizes. Equally important is careful cleaning of the inferior acetabular margin, removing any osteophytes and fibrous tissue that can often obscure visualization. Once this is done, the next step is to create the seat for the hook below the margin by clearing enough space to expose the cortical bone at the margin and allow the hook to be inserted and oriented easily. This is a crucial stage and one where mistakes are often made. Selecting a device that fits the bone loss, with the plate resting on the host bone, will undermine the intrinsic benefits of this device since it will always be too big. The hook will not correctly engage with the lower margin, meaning there will be no tension in the reconstruction. 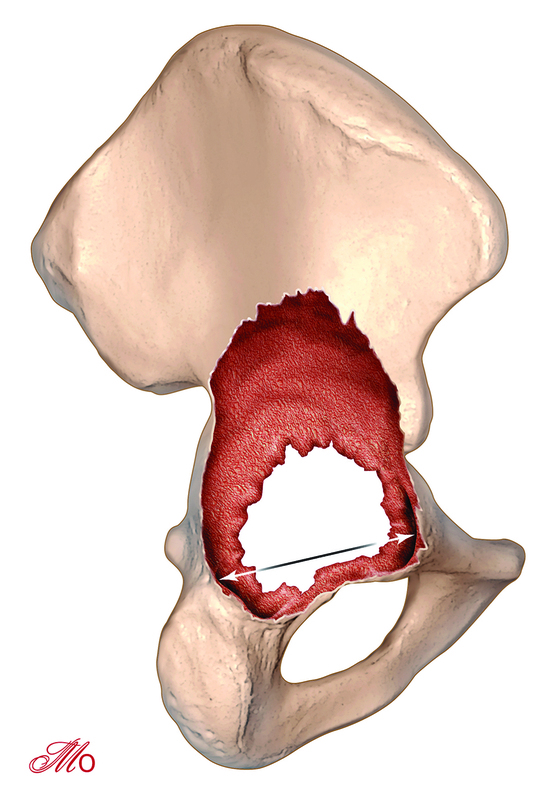 The plate will also be separated from the iliac bone so either will have to arch in order to create contact or will sit too vertically; in both cases the device stops being a reliable marker of the positioning or orientation of the acetabulum (Fig. 5). Figure 5 : Examples of oversized and badly positioned devices. This type of reconstruction often culminates in early failure because the hook is not stably engaged beneath the margin, and so the whole implant remains mobile and in the short to medium term either the screws or the plate will break due to fatigue. The size of the device must therefore reflect the patient’s original anatomy. The choice is easy when the opposing hip is intact, because you simply have to select the size that matches the native acetabulum. The anteroposterior diameter of the distal native acetabulum between the remnants of the anterior and posterior horns should be used as a reference during the procedure, bearing in mind that, when intact, they are 6–8mm thick (Fig. 6). Figure 6 : Selecting device size based on the anteroposterior diameter of the caudal acetabulum. If this rule is followed, once the hook is placed beneath the margin and properly engaged, the plate will automatically adopt the optimum orientation (Fig. 7). 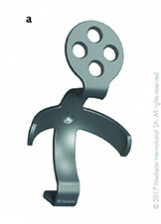 Figure 7 : Volume of graft required and automatic orientation of the plate when the hook is correctly positioned. Once you have chosen the correct size of cross-plate, it must be positioned properly. The hook should be inserted in contact with the posterior part of the inferior margin and held in place by a double-angled retractor. When this is done, pressing on the base of the device towards the anterior part of the roof behind the anterior inferior iliac spine will cause the plate to sit naturally in the correct orientation (Fig. 8). This section must be scraped to expose the bone cleanly and remove any remaining muscle fibres or capsule remnants from beneath the plate. With the plate in place, it is easy to estimate the volume of the graft. The whole space between the reinforcement device and the native bone, both upper and lower, must be filled. It does not matter if the plate will be resting only on the graft, provided that the latter is structurally sound and there is tension between the screws and the hook, which must engage tightly with the inferior margin. By way of example, we will use a case involving bone loss of the roof and walls but no medial wall defects and an intact inferior margin. The technique for reconstructing the medial sections and inferior margin will be discussed afterwards. Personally, I prefer cryopreserved allografts from the femoral head or inferior end of femur. The size and compaction of this type of graft are simpler than those of their dehydrated counterparts. On the other hand, the preparation required takes longer and is more painstaking in order to preserve only cancellous bone. It can be helpful to begin by coating the whole of the bone cavity with a layer of either natural or hydroxyapatite morselized graft. This will fill the defects in the pubis and ischium as well as any crevices in the back and roof. In addition, it will stabilise the superior allograft used to reconstruct the roof. We begin by modelling the convex surface of the graft to ensure as snug a fit as possible with the shape of the bone loss in the superior region. Sometimes, simple impaction is all that is required to obtain the necessary stability, but more often the graft has to be fixed with either pins or screws. Also, the bed of morselized graft will serve to fill any gaps between the structural allograft and the medial wall of the acetabulum. Once the graft is fixed in place, it can then be shaped using a burr to adapt it to the convexity of the device and create a close contact, with a hook that is not yet under tension but is nevertheless stable beneath the margin and with the desired orientation (Figs 9, 10, 11). Figure 9 :Temporary fixation of the superior allograft resting on a morselized bed, here created using hydroxyapatite granules. 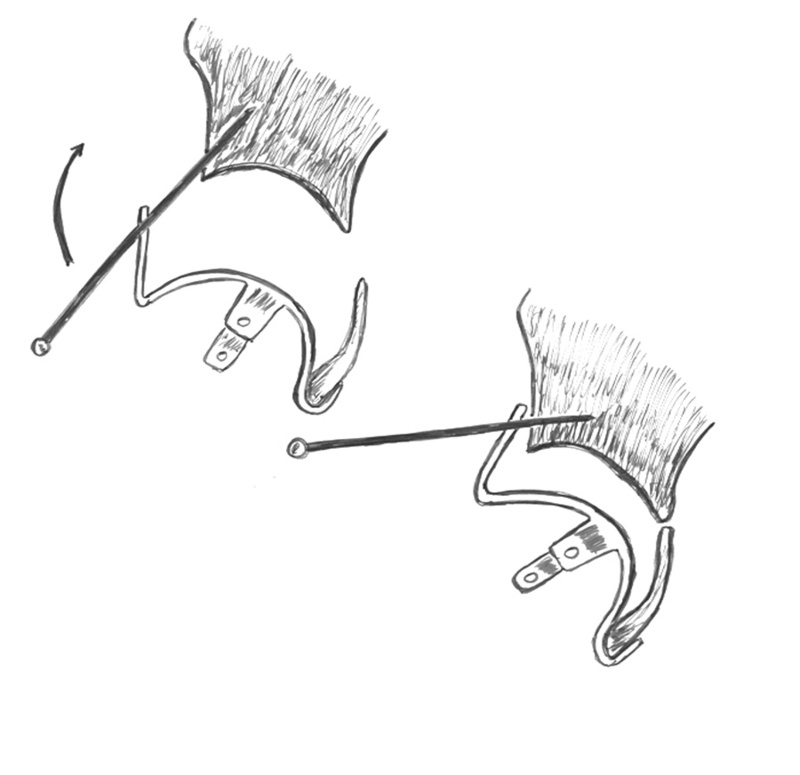 Figure 10 : Gradual preparation of the graft to obtain close contact with the plate and a stable hook. Figure 11 : Fitting and screwing the final device, checking the stability of the plate. It is always easier to reduce the size of a large graft than to add fragments. There should therefore be no hesitation in using an oversized graft for the roof and walls, and then gradually reducing the size to obtain the desired contact with the plate. Once the device is fixed in place, any remaining gaps between it and the bone cavity can be filled with heavily impacted fragments of graft (Fig. 12). Figure 12 a et b : Filling any remaining spaces using special bone impactors. For the walls, again use large fragments wedged between the arms of the cross-plate and the proximal part of the acetabulum; note that if they are inserted in the lower part it is impossible to stabilize them, and direct screwing can be hard and is often not very effective. I believe that true compression can only be achieved with bicortical screws, as opposed to cancellous bone screws. It is of course important to be gentle and careful when drilling beyond the medial cortex to avoid damaging any structures inside the pelvis. Fixation should always begin with the distalmost screw on the plate (Fig. 9). Figure 9 : Temporary fixation of the superior allograft resting on a morselized bed, here created using hydroxyapatite granules. After tightening this first screw, check that the hook is stable enough to not be pulled out of place with forceps. If this is not the case, first check that the hook is correctly inserted beneath the margin and not resting on an osteophyte. If the hook is not the problem, the reconstruction must be augmented using a slice of graft inserted between the plate and the superior graft or directly on to the iliac bone if it is in contact with the plate. Horizontally aligning the plate will stabilize the hook. If, despite this adjustment, the hook remains mobile or tends to slip off when the screw is tightened, it means the device is too large and the next size down should be tried. Ensure that any anteversion is neutralized before inserting the remaining screws. If not, loosen the distalmost screw, reposition the device and then insert the anterior screw, keeping the same orientation. Once anteversion has been stabilized using the two screws, the distal screw can be tightened up again. Use of two screws is always mandatory. If there is extensive bone loss, it may be wise to use three or four screws, depending on the size of the plate. Always go back and tighten every screw once they are all in place because the plate will gradually press down on the bone and the first screws may become disengaged from the plate once the final screw has been tightened (Fig. 13). 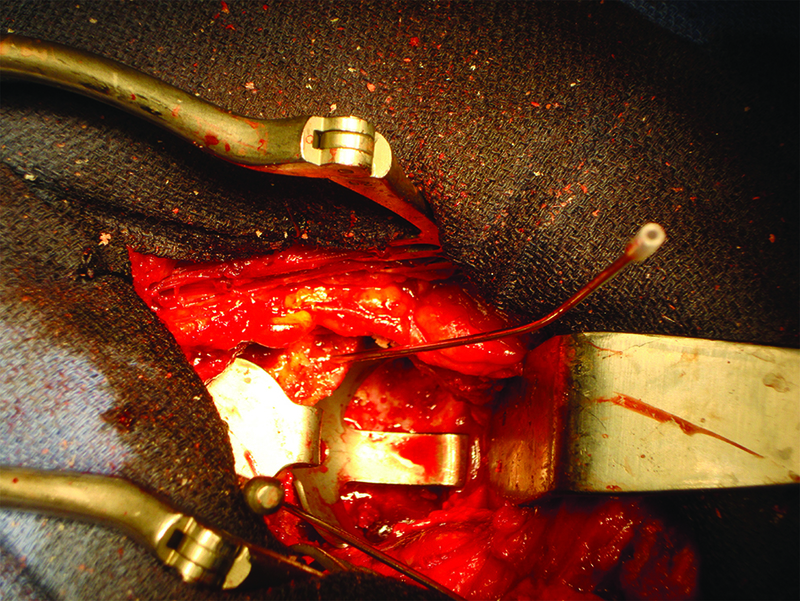 Figure 13 : Anterior and posterior walls reconstructed using grafts wedged between the arms of the cross-plate and the superior graft. 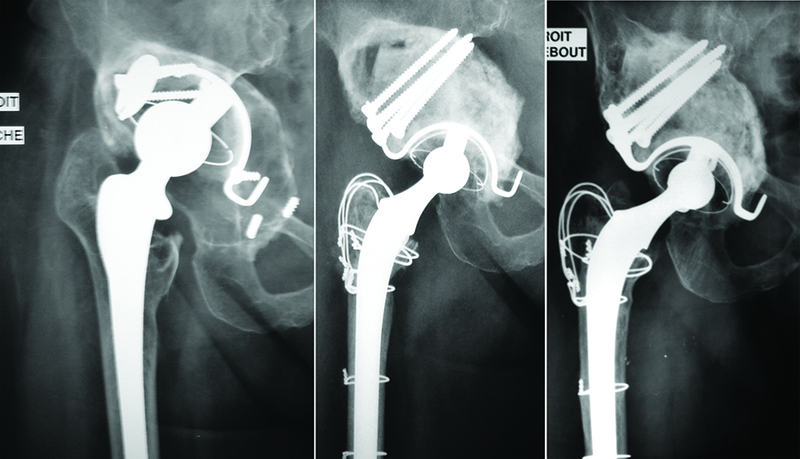 Dual-mobility cups are now very often – and sometimes even routinely – used for acetabular reconstructions with a Kerboull reinforcement device. It is therefore important to ensure the chosen range of dual-mobility implants meets two requirements. First, a sufficient number of sizes must be available to be able to match the size of the chosen reinforcement device. 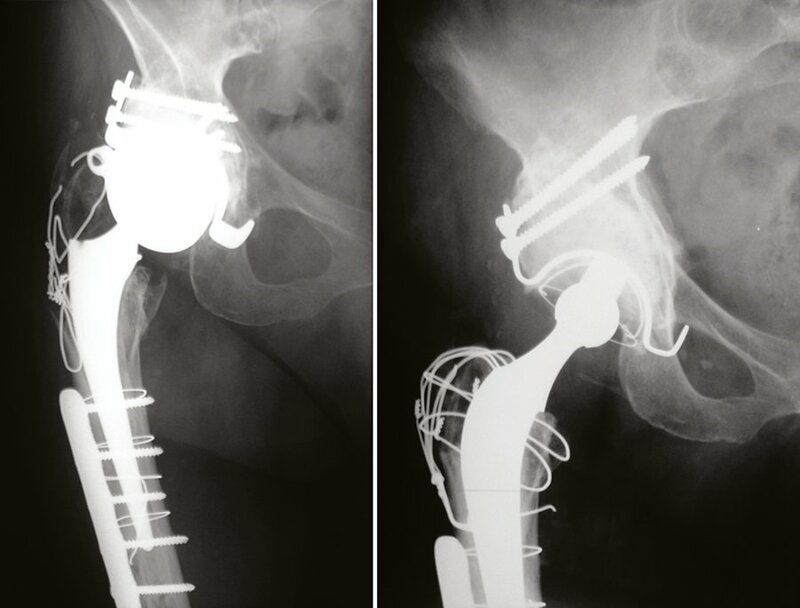 Obviously, if you have to use a larger reinforcement device to be able to use a particular dual-mobility acetabulum, then you will jeopardise the survival of the bone reconstruction, all for the sake of avoiding the problems of early dislocation (Fig. 14). 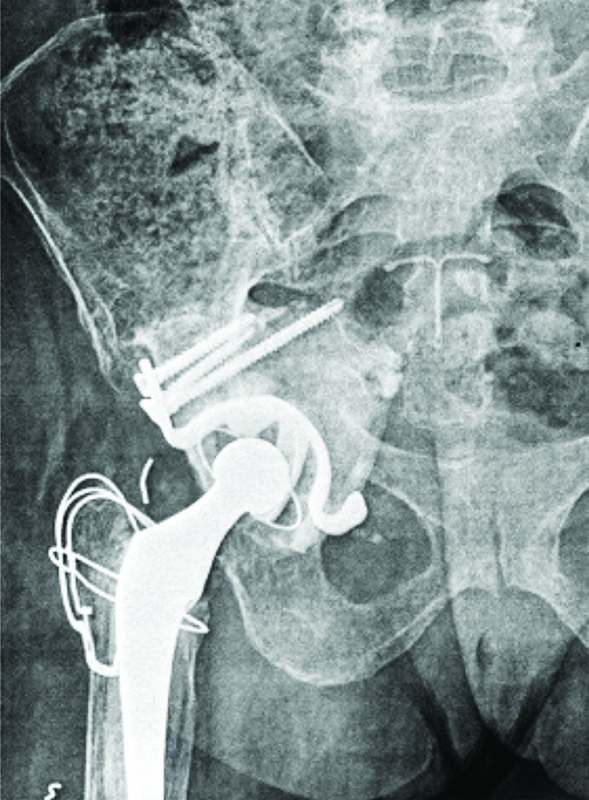 Figure 14 : Incorrect positioning of an oversized reinforcement device to cater for a dual-mobility acetabulum that is too large, resulting in failure after 2 years. Revision with a new reconstruction and result at 13 years. The second is that the shape of the acetabulum must match that of the reinforcement device in order to avoid having to adapt the shape of the device. Although I recognize the usefulness of dual-mobility cups for reconstructions when there is irreparable muscle damage or in very elderly patients, I do not believe they ought to be used systematically. They make the reconstruction unnecessarily rigid, jeopardizing the osseointegration of the graft. They also place excessive stress on the device that undermines its resistance to fatigue. Therefore, whenever I think the risk of dislocation is manageable, I prefer to use a highly cross-linked polyethylene cup. Whether the cup is polyethylene or dual mobility, the principles of cemented fixation are the same. The acetabulum must fit easily into the device without the need for force, and adapt to its orientation. It should be aligned with the end of the anterior arm for anteversion, and with the opening planes aligned in order to have the same incline. The cement should be of normal viscosity and applied when still soft but not liquid. There is no point using a lot of cement at the bottom because it is of limited use in this area and risks leaking through the obturator foramen (Fig. 15). Figure 15 :Placing a thin layer of cement on the inferior part. Once the acetabulum is fitted inside the device, all excess cement must be removed from the edges and then axial pressure exerted using a spherical instrument that cannot alter the anteversion or incline of the cup, should the orientation change. The inferior acetabular margin is crucial for the success of this technique and must therefore be reconstructed or reinforced if it has been destroyed or is weakened. There are three possible situations. This type of defect is usually largely triangular in shape and spares the medial wall, which remains intact but weak (Fig. 16a). Figure 16 a, b, c, d : Reconstructing the inferior margin. If this destruction is overlooked, then the hook will engage higher up on weakened bone. 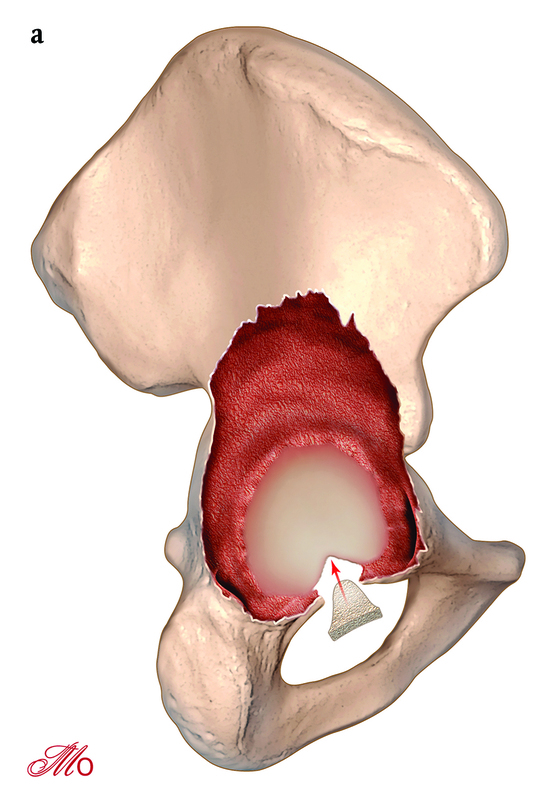 Reconstruction will not restore the acetabulum to its anatomical position; instead, it will be only weakly anchored at its distal point and therefore jeopardised. In this case, you need to make a corticocancellous beam and stabilize it between the hook, the lower edge of the remaining medial wall and the horns. Once again, the best approach is to begin with a fragment that is too large and can be gradually reduced in size until it wedges in. A good solution is generally to use a half-head from a bone bank, cut longitudinally (Fig. 16 b,c,d). Figure 16 a, b, c, d: Reconstructing the inferior margin. The cephalic section is used to fill the medial defect, and the remainder of the femoral neck to reconstruct the inferior margin. The edges of the head fragment should be bevelled to encourage a flush fit. Impact the bone gradually and carefully, bearing in mind that screw fixation is not possible. In this situation, the technique described above will not work because there is no lateral support for the graft. Instead, you need to use a very large graft shaped from a distal femur or giant femoral head. This fragment will no longer be blocked frontally, but along the sagittal plane between the pelvic ring and the remaining ilium. It may be useful to screw the cranial part for greater stability and therefore comfort during the final stages of preparation. 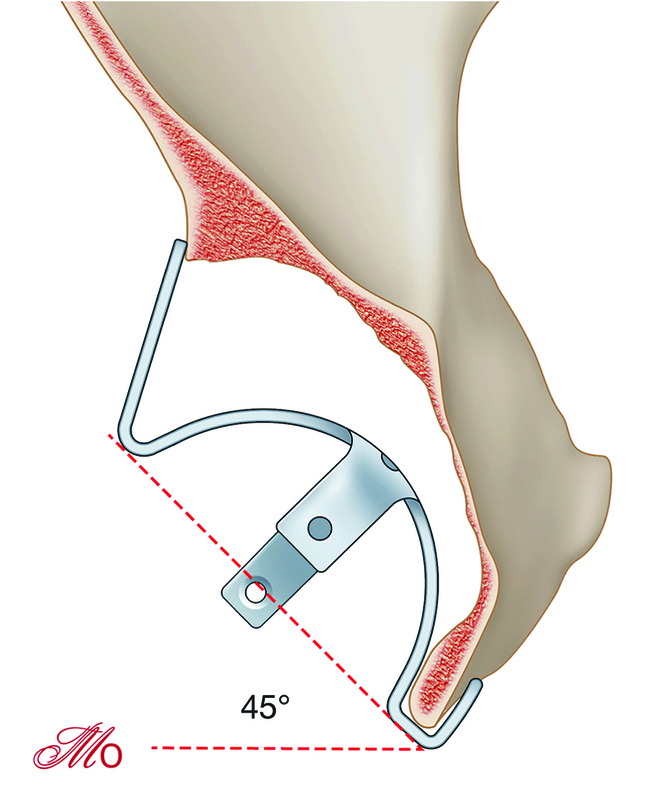 The hook gets inserted beneath the cortical part, which reconstructs the margin and the bony acetabulum, the latter carved out of the cancellous bone, usually between the two femoral condyles of the allograft (Fig. 17). Figure 17 : Distal femoral allograft reconstructions. With this type of defect, the reinforcement device is used for its original indication. 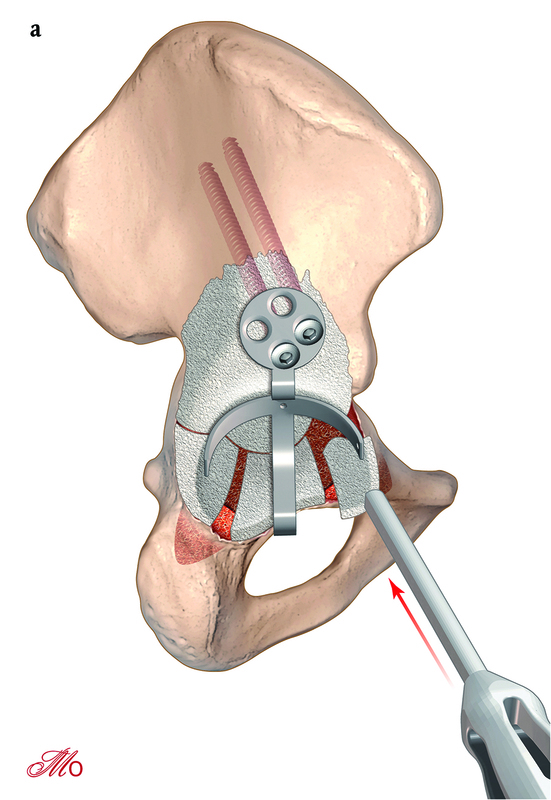 The hook has to be inserted beneath the margin then, using a long Steinmann pin inserted into the upper hole of the plate and implanted in the iliac wing, gradually reduce the displacement between the two parts of the iliac bone by using bone-holding forceps to verticalize the nail (Fig. 18). 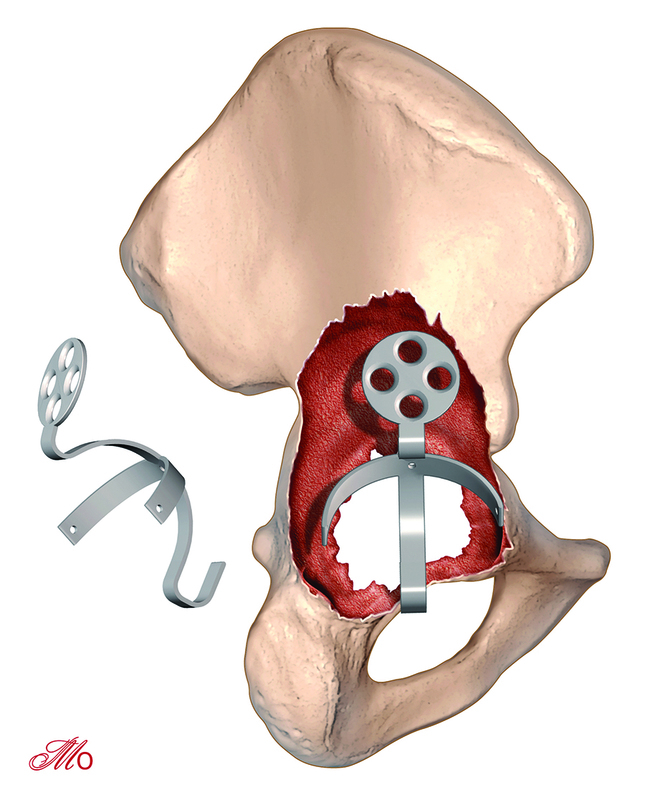 Figure 18 : Reduction of pelvic ring disruption using a Steinmann pin. Once the displacement has been reduced, the medial and lateral defects can be filled. The final stage is to fix the plate. There is absolutely no point trying to reduce the discontinuity in this situation. The best thing you can do is fill the defect with a graft and stabilize the assembly. This type of bone loss, which is fortunately rare, pushes the technique to its limits. The reinforcement device cannot alone guarantee a stable reconstruction, and a large graft cannot be stabilized because the pubis and ischium are no longer connected. In these desperate cases, if you want to fill the defect then it is sometimes necessary to begin by fixing the posterior column using a screwed plated in order to restore a certain degree of rigidity, and then embed a massive allograft that will house the device. The screws should be angled upwards and backwards as much as possible, in the hope of finding a solid anchor in the host bone. These are relatively simple and easy to understand. The main causes of early failure are technical errors such as instability of the reinforcement device or not enough graft being used (Fig. 19). Figure 19 : Early failure at 2 years due to resorption of an insufficient quantity of graft in the roof. More rarely, the failure is related to graft resorption, probably as a result of poor quality or rare cases of an immunoallergic reaction. Late failure can be caused by wear of the polyethylene, creating a granuloma that gradually resorbs the graft and quickly leads to breakage of the plate or screws (Fig. 20). Figure 20 : Late failure at 13 years due to wear and resorption of the graft by a granuloma. The long-term results confirm the reliability and efficacy of this technique, provided the surgeon follows all the stages properly. Technical mistakes will soon be punished. In addition, the quality of the graft and its mechanical resistance are two crucial factors for a long-lasting reconstruction, although I admit we have yet to master these two aspects of the procedure fully. The graft must be resistant in the load-bearing region, and preferably too large rather than too thin. It is a demanding technique that will succeed only if the surgeon is both patient and thorough. In order to reassure the less experienced, I would like to conclude by saying that even after 27 years in practice, I still sometimes have to redo a reconstruction if I think it is unsatisfactory, and to take intraoperative X-rays to check that the joint has been correctly reconstructed. In return for this thoroughness of approach, I am now seeing patients who, 20 years on from their operation, are enjoying an anatomical and perfectly stable bone reconstruction. 2. 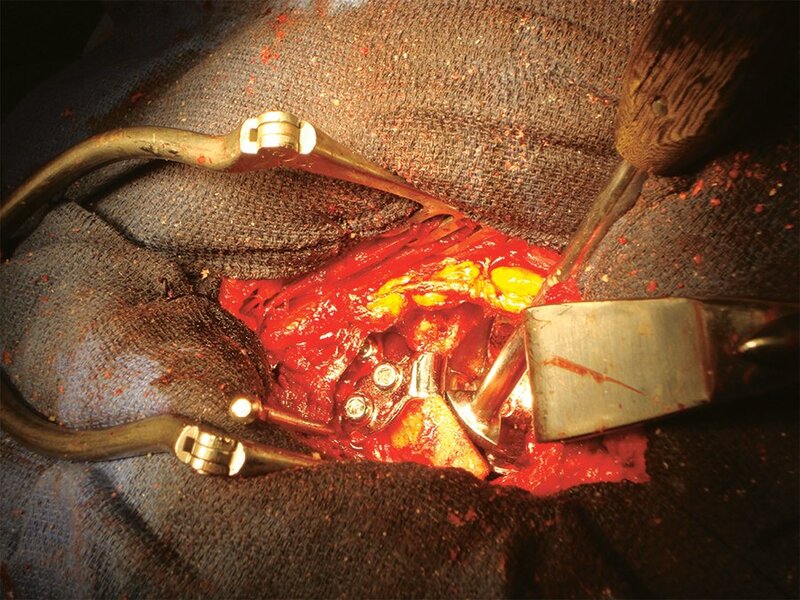 Makita H, Kerboull M, Inaba Y, Tezuka T, Saito T, Kerboull L. Revision Total Hip Arthroplasty Using the Kerboull Acetabular Reinforcement Device and Structural Allograft for Severe Defects of the Acetabulum. J Arthroplasty. 2017 Nov;32(11):3502-3509. 3. Tanaka C1, Shikata J, Ikenaga M, Takahashi M. Acetabular reconstruction using a Kerboull-type acetabular reinforcement device and hydroxyapatite granules: a 3- to 8-year follow-up study. 4. 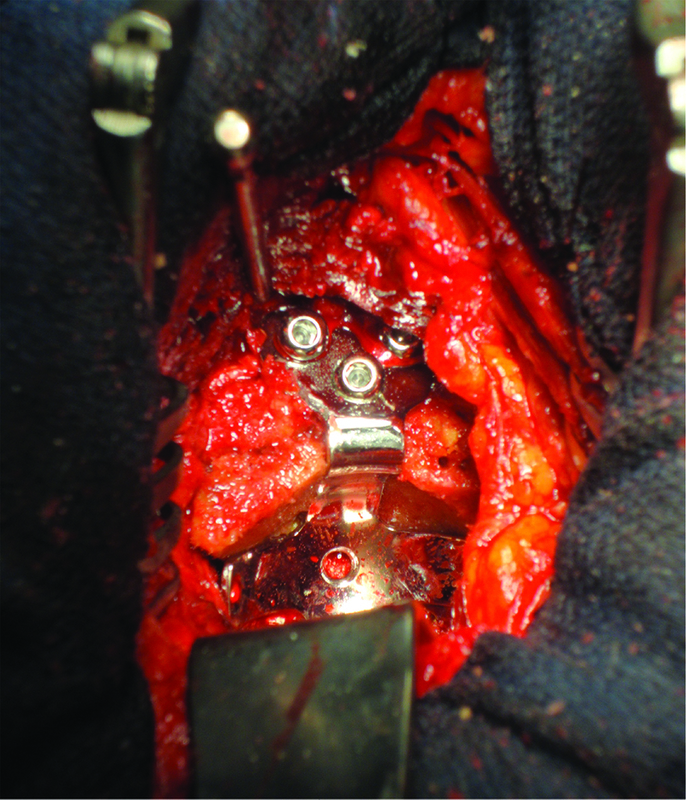 Kerboull M. Revision surgery for aseptic loosening of total hip replacement. 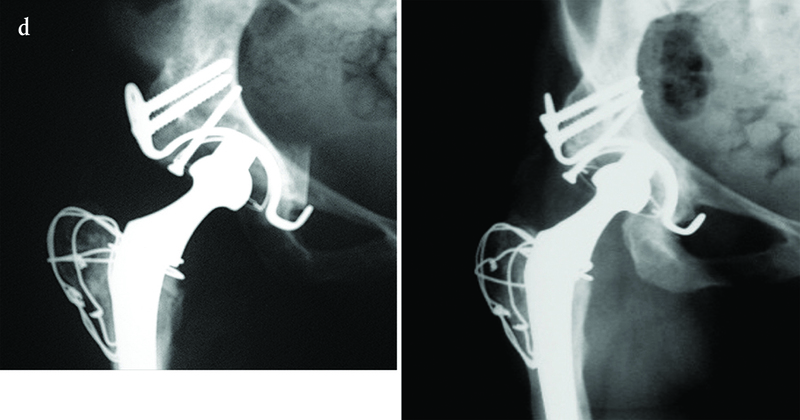 In: Postel M, Kerboull M, Evrard J, Courpied JP (eds) Acetabular reconstruction, Total hip replacement. Springer Verlag, Berlin (1985), pp 85–90. 5. 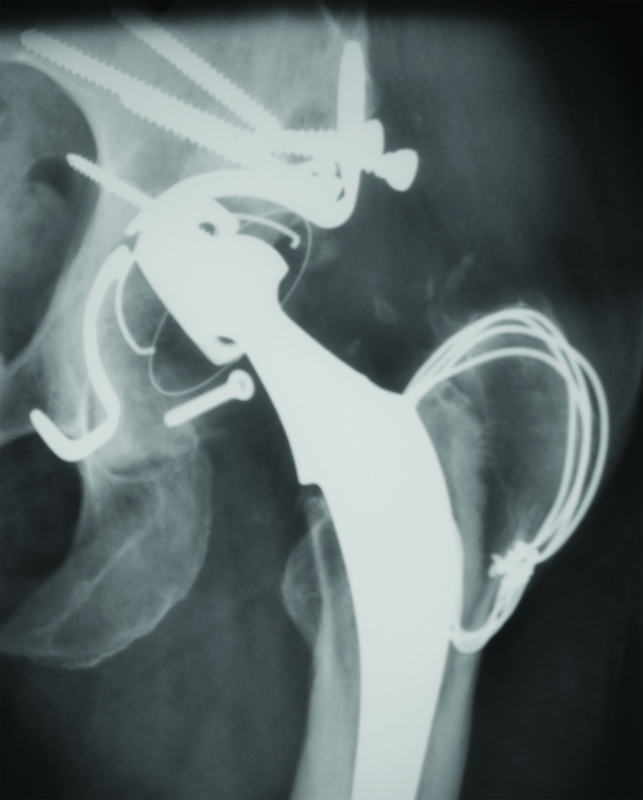 Akiyama H, Yamamoto K, Tsukanaka M, Kawanabe K, Otsuka H, So K, Goto K, Nakamura T. Revision total hip arthroplasty using a Kerboull-type acetabular reinforcement device with bone allograft: minimum 4.5-year follow-up results and mechanical analysis. J Bone Joint Surg Br. 2011 Sep;93(9):1194-200. 6. 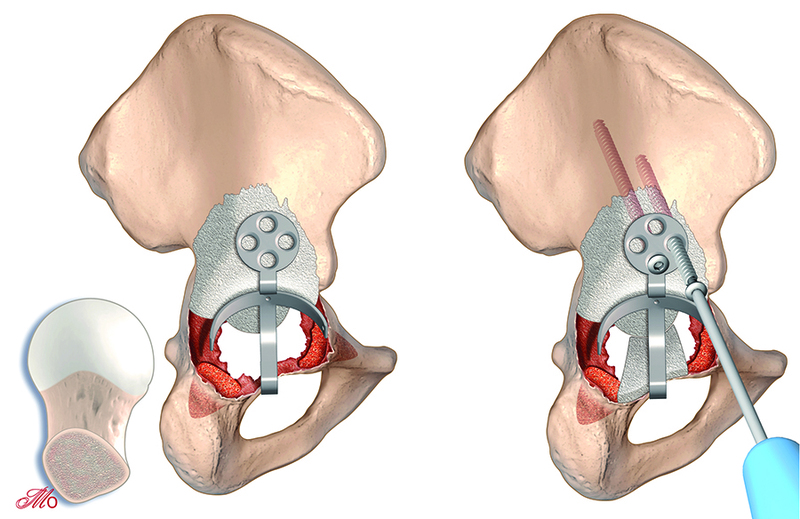 Hori J, Yasunaga Y, Yamasaki T, Yoshida T, Oshima S, Yamasaki K, Matsuo T, Ochi M. Mid-term results of acetabular reconstruction using a Kerboull-type acetabular reinforcement device. Int Orthop. 2012 Jan;36(1):23-6. 7. Oe K, Iida H, Tsuda K, Nakamura T, Okamoto N, Ueda Y. Bone Remodeling in Acetabular Reconstruction Using a Kerboull-Type Reinforcement Device and Structural Bone-Grafting in Total Hip Arthroplasty. J Arthroplasty. 2017 Mar;32(3):908-914. 8. 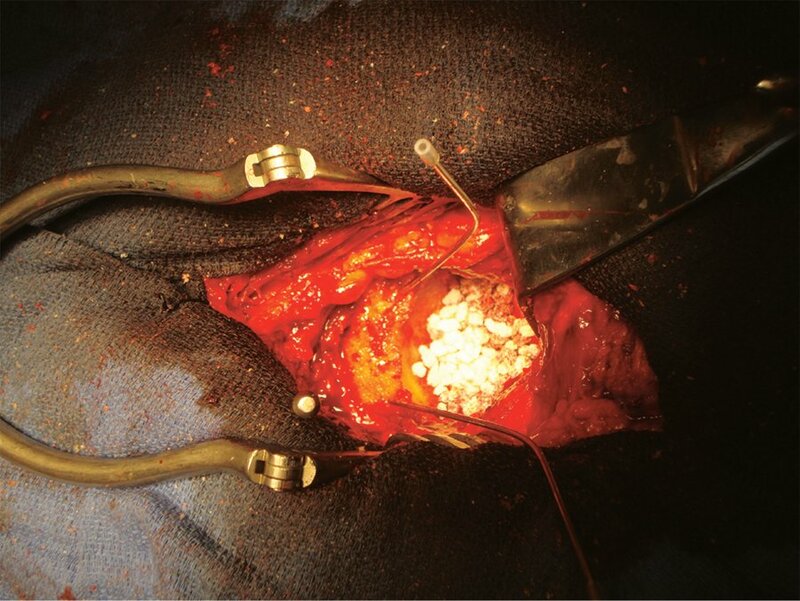 Inoue D, Kabata T, Maeda T, Kajino Y, Yamamoto T, Takagi T, Oomori T, Tsuchiya H. The value of bulk femoral head allograft in acetabular reconstruction using Kerboull-type plate. Int Orthop. 2015 Sep;39(9):1839-44. 10. Ohmori T, Kabata T, Kajino Y, Hasegawa K, Inoue D, Tsuchiya H. Safe zone for trans acetabular screw fixation using a Kerboull cross-plate: A CT-scan templating prospective study. Orthop Traumatol Surg Res. 2016 Dec;102(8):1017-1022.